No woman wants to look in the mirror and see cellulite looking back at her. The appearance of dimpled skin on the upper legs and buttocks area can cause incredible embarrassment. Sadly, many women who have cellulite feel incredibly self-conscious about their appearance. However, it’s possible that essential oils can actually help with this extremely common issue. That dimpled, lumpy appearance that often appears on the thighs and buttocks is the result of fat deposits that have made their way through the skin’s connective tissue. Therefore, the fat deposits sit right beneath the skin’s surface. Cellulite is more common in women because of how fat deposits in the female body (source). 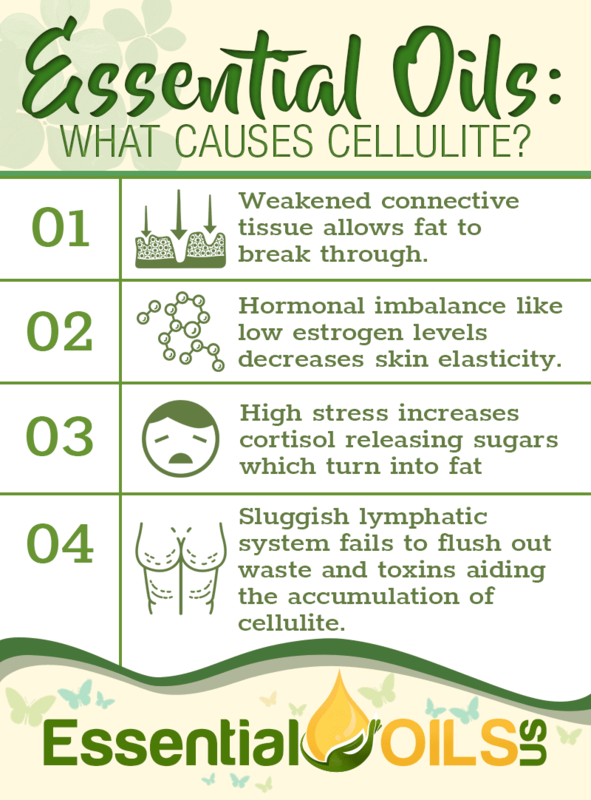 Despite how common cellulite is, its causes are relatively unknown. However, doctors have determined several factors that can contribute to the development of cellulite. For these fat deposits to break through the connective tissue of the skin, the skin’s layers have to be in a weakened state. That’s why many doctors believe that poor circulation is a major factor. Areas of the skin that don’t get enough circulation won’t be receiving the nutrients needed to keep the skin’s connective tissue strong (source). A hormonal imbalance is believed to be another factor. Low estrogen levels can cause collagen levels to decrease, reducing the skin’s amount of elasticity (source). Fascinating new research suggests that stress levels can increase the chances of developing cellulite. When excessive amounts of cortisol are running through the body, sugar that has been stored within the body is released to aid in the release of adrenaline into the bloodstream. Once the cortisol levels return to normal, this sugar can get redistributed throughout the body in the form of fat deposits that settle in the buttocks and upper leg area (source). Some studies suggest that the lymphatic system can also determine whether or not a woman is susceptible to cellulite. The lymphatic system helps flush out waste and toxins that accumulate throughout the body. Some researchers have found a strong correlation between a sluggish lymphatic system and cellulite accumulation (source). As of now, there is a lot of debate regarding whether or not cellulite can actually be completely eliminated from the body. 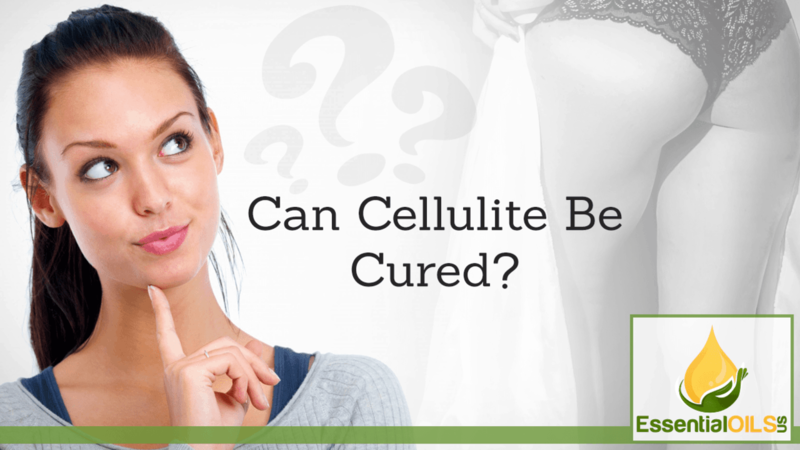 According to many doctors, the most that one can hope for is a reduced appearance of cellulite. One of the greatest misconceptions about cellulite is that it only affects those who are overweight or out of shape. The truth is that even someone who is perfectly fit and trim can develop cellulite. However, being overweight can make the appearance of cellulite more noticeable (source). There’s also a myth floating around that a regular cardio routine can get rid of cellulite. Because cellulite has nothing to do with a person’s overall weight and fitness level, simply going for a run everyday won’t make cellulite magically disappear. Another common misconception about cellulite is that it only affects older people. This simply isn’t the case. 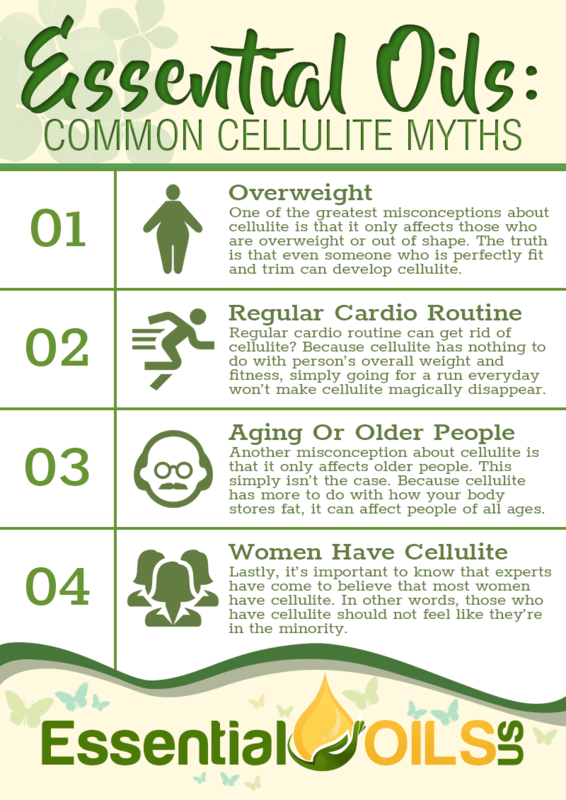 Because cellulite has more to do with how your body stores fat, it can affect people of all ages (source). Lastly, it’s important to know that experts have come to believe that most women have cellulite. In other words, those who have cellulite should not feel like they’re in the minority. As we’ve stated earlier, it’s possible that cellulite cannot be cured. However, there are several essential oils that may reduce the appearance of cellulite while preventing more cellulite from developing. By boosting circulation to areas of the body in which cellulite develops, you can strengthen the skin’s connective tissue. Some essential oils that have been found to increase circulation when applied topically are ginger, eucalyptus, black pepper, lavender and neroli. 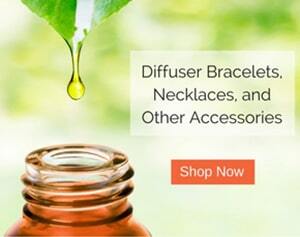 All of these essential oils boost blood flow naturally by absorbing into the bloodstream through the skin. From there, they actually open up the blood vessels, allowing more blood to pass through with ease. This increases overall circulation to the area, often causing a pleasant warming sensation. These essential oils help the lymphatic system in a similar way. As natural, safe stimulants, they allow toxins to flow through the lymphatic system with ease. We said earlier that poor collagen production can make it easier for fat deposits to push through the skin’s connective tissue. Therefore, it’s important to make sure that collagen levels remain as high as possible. Since estrogen is responsible for consistent collagen production, finding some essential oils that naturally maintain healthy estrogen levels is key. One essential oil that is known to naturally boost estrogen levels is clary sage. With its phytoestrogenic properties, clary sage essential oil mimics estrogen when absorbed into the bloodstream. As a result, it promotes the production of collagen that keeps skin strong and elastic. Another essential oil that naturally boosts estrogen production is rosehip. In fact, this essential oil is often used in skin products that are intended to reduce the appearance of wrinkles and fine lines. This is because of the oil’s natural ability to improve collagen production when applied topically to the affected area. Lavender essential oil has been proven to reduce stress levels by naturally slowing down the nervous system, resulting in a lower level of cortisol throughout the body. By reducing levels of cortisol within the body, the body will not be as likely to redistribute fat cells in a way that can cause cellulite to develop (source). Lavender’s ability to lower stress levels is so profound that simply inhaling the oil can dramatically slow down the nervous system. Many people diffuse this oil in the home on a daily basis as a way to maintain a sense of tranquility throughout the day. When you inhale lavender essential oil, its chemical compounds travel through the nasal passage and quickly signal the release of hormones that calm the body and mind. These chemical compounds are so potent that a little will go a long way. 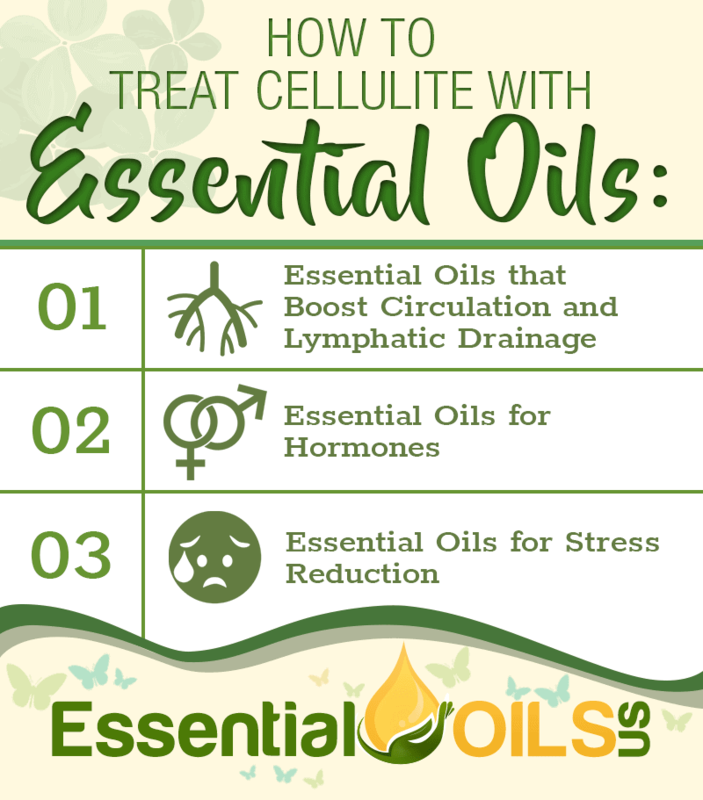 These essential oils may be able to both prevent and improve the appearance of cellulite by getting to the underlying causes for this common condition. 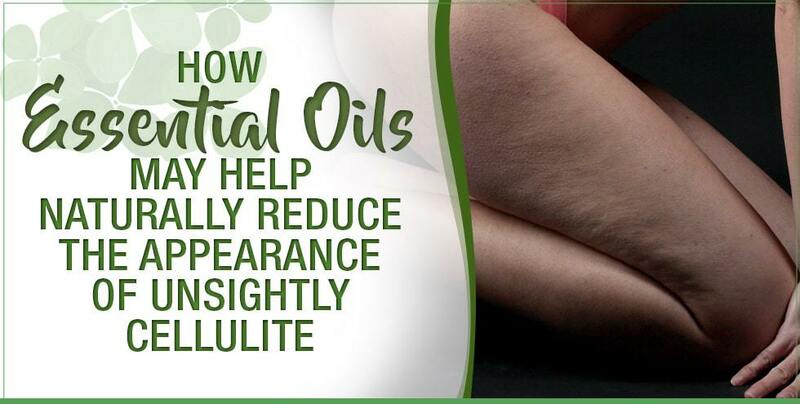 If you’ve been able to reduce the appearance of cellulite naturally with essential oils, feel free to leave us a comment!